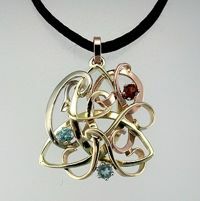 Customized Mothers Pendants-Create and Customize with Birthstones- By Designet! 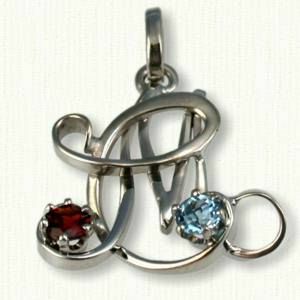 Custom Mothers monogram pendants with gemstones are the ideal gift to celebrate a birthday, anniversary, engagement or Mother's Day. We have created these as gifts for brides to commemorate her special day and new name as well as for Mother's Day gifts. Hand made 14KT Tri-Tone 'MKE' monogram pendant with three birthstones. Hand made 14K White 'CM' monogram pendant with two birthstones. 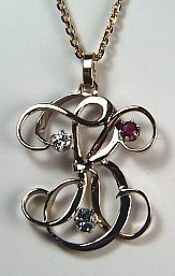 Hand made 14KY 'AA' monogram pendant with 14KW guardian angel. 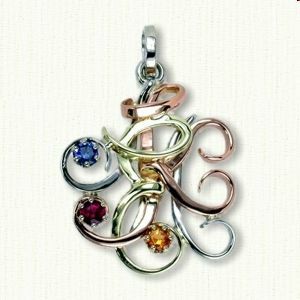 Hand made 14K Tri-Tone 'CKP' monogram pendant and three birthstones. 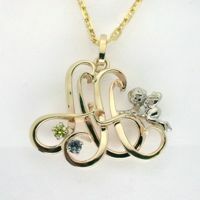 Hand made 14K Yellow and White 'GL' monogram pendant with two birthstones. 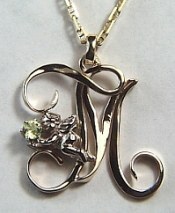 Hand made 14KY 'T M' monogram pendant with 14KW guardian angel and peridot. We can create something similar using the initial(s) of your choice and most any birthstone. Visit our Religious Jewelry Collection for other ideas. 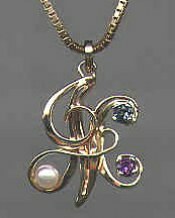 14kt Yellow gold "J M" pendant with three gemstones. 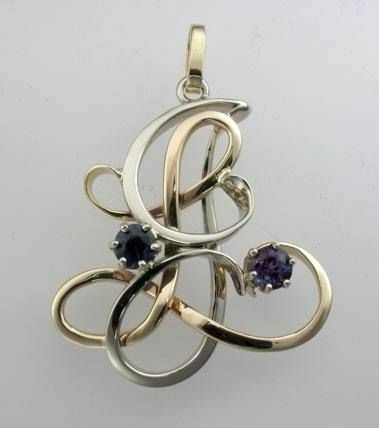 Two tone 14kt yellow and white gold mothers monogram with "T B K" children's / mother's initials set with three birthstones: a diamond, an aquamarine and a ruby. A perfect gift for any Mother! 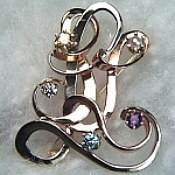 We offer monogram pendants, rings, earrings, bracelets and pins set with genuine or synthetic birthstones. For more ideas, please visit our Monogram Jewelry page.